they can sweep through the society with catastrophic effects not only on public health, but social institutions and the economy as well. Social cohesion is further diminished if poor or minority families suffer more from infectious disease than middle class whites. The control of such diseases is therefore critical to sustain well-being and social stability. Figure 23.1 shows the rate of newly reported cases of three major infectious diseases in New Jersey since the mid-1980s. As it shows, the rates of some key infectious diseases have decreased since the 1980s. AIDS cases peaked in 1993, decreased through 1998, and since then have leveled off. In 2002, the rate of new AIDS cases was 16.3 per 100,000, which is about a quarter of the level of 1993, 64.1. 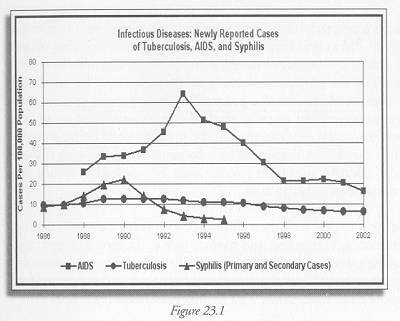 Syphilis cases per 100,000 decreased dramatically from 22.0 in 1990 to 0.8 in 2000. Some experts have suggested that this decline may be a direct result of sexual behavior changes in response to concerns with AIDS. In addition, at 6.2 per 100,000 in 2002, verified tuberculosis cases were at their lowest level of the past 15 years. The New Jersey Department of Health established targets for the reduction of infectious disease in their 2001 report Healthy New Jersey 2010. (1) By 2010, the goal was to reduce the AIDS rate to 14.6 per 100,000, the tuberculosis rate to 2.4 per 100,000, and the primary and secondary syphilis rate to 0.5 per 100,000. The Department’s strategies for working towards these goals place a strong emphasis on surveillance, to make sure that public officials know of new cases and can take steps needed to prevent them from spreading further. On TB, the Department is working to ensure that those with active TB complete their treatment as prescribed, to reduce the spread of infection and prevent the development of antibiotic resistant strains. If current trends continue, these goals may be reached for tuberculosis and syphilis, but the prospect is not as encouraging for AIDS.